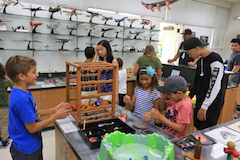 Based on the 4A's (aeronautics, astronomy, astronautics and atmospherology), the Aerospace Education Lab provides Windward communities with high quality educational opportunities. The AEL includes a hands-on exploratorium, a lending library of resources and an online curriculum guide. The Aerospace Exploration Lab resources are available free of charge. To book a school visit or to make an appointment to borrow resources, call 235-7321. 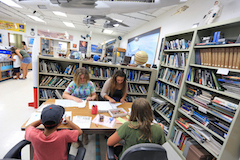 Teachers may borrow any of the Aerospace Exploration Lab's lending library resources, free of charge. To arrange a time to select and borrow resources, call 235-7321. A multidisciplinary curriculum guide that celebrates the human spirit of adventure--the driving force that has long propelled vessels across the oceans and now hurls ships through outer space.